Reunion [ree-yoon-yuhn] Noun—A gathering of relatives, friends, or associates at regular intervals. The Johnson clan from Kentucky, to which I lay claim for half of my heritage, just completed another successful reunion in Texas, near Burleson. The familial get togethers, held for at least as long as I can remember, were Kentucky events for many years. But, in the last decade or two, other locations convenient to surviving members and growing families have included Texas, Arkansas and other regions. It’s been surprising to hear comments lately that family reunions in America are declining. If so, the Kentucky Johnsons haven’t been informed. In fact, one day just isn’t enough when they converge. Their gatherings have been known to last up to a week. Arthur George Johnson, my mother’s father, is responsible for starting the events that have become family legend. He was born in 1894 and married Bernice Conlee before they settled in central Kentucky, started a family and spent the majority of their lives as educators. My mother, Indianola Johnson, was the first child born to their union in 1923. Siblings following her included three sisters and two brothers who all grew up calling Winchester in Clark County, Kentucky, home. Arthur Johnson did not live a long life by most standards. He died of cancer in 1951. He did accomplish a number of remarkable things, however, including instilling in his children an incredible sense of close family ties. Among documents in my possession today is a letter he wrote to my mother on the occasion of her marriage. She was preparing to marry a young soldier by the name of Aldridge from Pittsburg, Texas, and this marriage would take her a long way off for 1944, away from the Blue Grass State and from her family. Likely adding gravity to the occurrence was the fact that she was the first child to leave home. His letter covered all the admonitions of which one might assume a father would offer his daughter, things such as love, honor and devotion. It also strongly urged the importance of remaining in touch with family and conducting frequent get togethers—advice he offered all his children, and advice they obviously took to heart. My earliest childhood memories are of Johnson family reunions in Kentucky for which every sibling was present. And this was no small feat. My mom moved to Texas where she was to live out her life. She was followed by two sisters who also called Texas home. The other sister settled in Ohio and the surviving brother in Southern California … before moving to Texas, to Phoenix and recently back to Texas. Geography proved to be no obstacle, however. Reunions were planned a year in advance and no one missed the homecomings with some driving half way across the country and through the night to attend. So how does a family spend a full week having a reunion? Not a problem for this bunch of Johnsons now numbering four generations deep. It takes at least two days of visiting to catch up with everyone else’s activities, events and stories. Throw in another day at the Kentucky reunions visiting with aunts, uncles, cousins and friends still residing in the area and the week’s half over. With many considering reunions as a vacation, there’s always a day or two to take in local attractions and landmarks. Last but not least are the cemetery research expeditions, typically including one unique to this family. It’s called Johnson’s Mountain. It’s a day’s drive and hike in and out of a wooded Kentucky hilltop where remnants of ancestor’s log cabins remain and where graves of previous generations of Johnson settlers dating to the 1700s typically need cleaning. Every generation is required to make the pilgrimage at least once. My mom was the oldest of her generation and I’m the oldest of my generation of cousins that has grown up more like brothers and sisters. Mom died in 2010, and declining health prevented her attending a number of the last several reunions while she was still living. The youngest Johnson sister died a few years before her, but the surviving three were in Burleson last weekend, plus representatives of every generation. 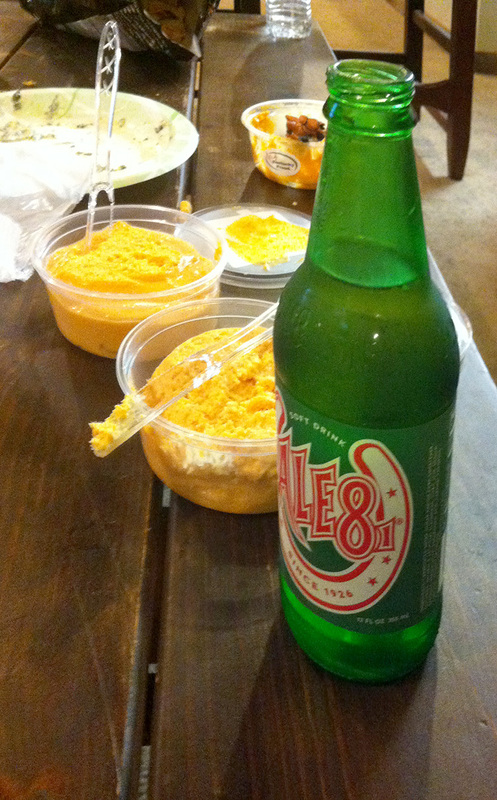 Stories about family members and events filled the late night hours supplemented with lots of snappy cheese dip and Ale-8-1 soft drinks—both Kentucky traditions rooted in the Winchester area. Many of the stories, I have heard more times than I can count. But, I’ll listen to them as long as they are still being told because with each recitation, there are variations that only time and the love for recounting family history firsthand can enhance. And that’s probably the best part of any family reunion, and the best reason I know of for continuing them—that, and the snappy cheese and Ale-8s. I too, enjoy the stories and tales told at this type of gathering. I read a memoir written by Larry McMurtry titled “Walter Benjamin at the Dairy Queen”. He alludes to the decline in the number of “story tellers” in today’s world for what ever reason and laments same as a sad development.